CCE faculty members Andre Barbosa and Christopher Higgins are participating in structural testing of a wood lateral-force resisting system, as part of the Framework Project, an anticipated 12-story tall wood building designed by Lever Architecture of Portland. Read more. A familiar presence in every corner of campus, Associate School Head Chris Bell’s 35-year career at Oregon State has taken him from CCE to the College of Engineering to INTO OSU – and even to Reser Stadium, where he serves as chief marshal of the annual commencement ceremony. Originally from England, Bell received his Ph.D. from the University of Nottingham. “I’ve been a transportation fanatic since I was eight years old,” said Bell. After earning his doctoral degree, he served as a lecturer at Heriot-Watt University in Edinburgh, Scotland. In 1981, Bell joined OSU as a visiting professor in CCE, specializing in highway and transportation engineering. In 1983, he was hired as a regular assistant professor. 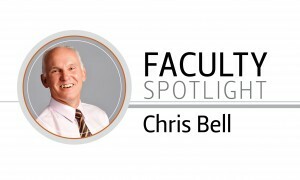 After earning a promotion to professor and directing the Transportation Research Institute for six years, Bell transitioned to the College of Engineering in 1997 as an associate dean, where he managed internships, awards, and international programs as well as graduate studies and industry relations. Following 11 years in that role, Bell became the director of academic programs for INTO OSU, an initiative that began in 2008 with a mission to increase the number of international students and to improve the overall level of service for that population. Not long after completing his three-year tenure, INTO OSU succeeded in more than doubling the number of international students, exceeding the university’s goals. In 2011, Bell returned to CCE as associate school head, with research interests in pavement materials and design, pavement-vehicle interaction, and truck operations and safety. Soon after his return, OSU was invited to join the Pacific Northwest Transportation Consortium (PacTrans) – one of 10 Regional University Transportation Centers nationwide – which was established in 2012 with an initial grant of $3.5 million from the US Department of Transportation. Bell is now finishing his term as the PI for OSU’s PacTrans efforts and as a member of the board of directors. “The universities in the PacTrans consortium have contributed heavily in safety and environmental sustainability research to address both regional and national transportation issues,” said Bell. The current PacTrans project portfolio at OSU spans a variety of focus areas, not just transportation engineering. Examples of this research are the use of mobile lidar to identify potential landslide locations and drones to perform highway bridge inspections. “I’m excited about what we do in this school – a lot of our research plays into transportation and to making major contributions in civil engineering as a whole,” said Bell.